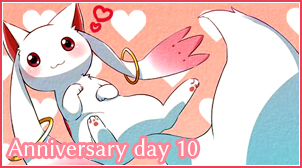 This lovely banner was created by Kuri! The Unown are known very well for all being in the shapes of letters but do they ever spell out anything? The answer is yes! 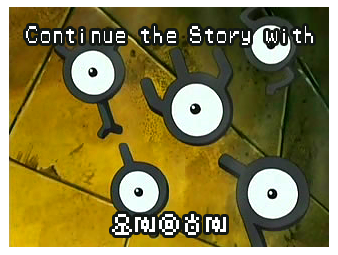 In fact, Unown have quite the love for story telling! They've decided to search out players that can spin one fancy tale and wow them! This round ends July 8! The next week of Information Exchange is up! Come on by and help Kyuubey and I continue our search! This round ends July 1! CLOSED! This lovely banner was created by Skie! Welcome back to another Information Exchange! Kyuubey and I are looking for some more Information so will you help us out? Perhaps some of you would like to contract with me as well? This game is quite simple. Every week there will be a set specification of cards Kyuubey and I will be looking for. All you have to do is find a card that meets these requirements and donate it! For that, You'll receive 3 cards but lose the card you donated so make sure you don't mind giving it away! The donation reset will be July 1! This round ends June 24! CLOSED! Prizes for first round will be passed out tomorrow! Anniversary Day 15 - Gotta Catch 'Em All! 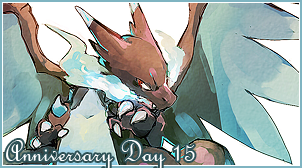 Welcome to day 15 of the Anniversary event! Today's Topic is: Gotta Catch 'Em All! What exactly do I mean by that? Simple. What sort of things make you wanna catch em all? As in, what sort of stuff, like tcg decks, do you collect? Do you want a whole plushie set? Or how about a whole figure set? Do you collect cards from actual TCGs like Yu-Gi-Oh or Pokemon? Second, how do you display them? Got a shelf where they all sit together? Or how about a page that lists all the tcgs you're in? Are you very big on neatness and orderliness with your collections? Answering this will give you a 15 choice character card and fourstival15! This discussion ends July 1st along with all the other anniversary games and discussions! The donation reset will be June 17! This round ends June 17! CLOSED! Hello there my precious magical girls. I'm here because it's time for you to live up to your side of the wish! I've spotted four rogue witches recently but I need help with identifying them first before we can proceed with destroying them. They've caused nothing but destruction so it's up to you all to take them down! I wish you the best of luck! /Allmia comes panting back in/ Well... I wasn't expecting that... Guess we're helping out Kyuubey again. Though I wonder if he realizes these girls aren't actually witches... Anyway, This game will end on July 1st along with the rest of the Anniversary games and discussions! This round ends May 20! CLOSED! This round ends May 13! CLOSED! The donation reset will be May 13! This round ends April 22! CLOSED! Here's the new RA post. Too many comments brought on the ridiculous captcha that makes no sense 50% of the time. Haha. Welcome to Recycled Art! The point of this post is pretty simple. All the cards that are used in games, leftover from players who quit, etc. all go into the Recycled Art page and are able to be claimed again by players! Please Read ALL the rules before posting your claims. You may claim 10 cards per week. This can change at any point in time depending upon the amount of cards in here. You may only claim cards once a week. This means that if you post a claim Tuesday, You cannot post another claim until Tuesday of the following week. Feel free to post your claims the next week even if I haven't answered your previous one. This is first come, first serve. If someone asks for a card first, they get it. Please pay attention to the posts above yours to check and make sure you're not asking for an already claimed card. Do not thread comments unless I respond to you and tell you a card you requested has already been claimed. in which case you may respond to me with a different card you'd like to replace the already claimed one. Please DO NOT ask for cards I haven't added yet. This means posts a mod makes here with cards from games, art shop, etc. Once they are added in and I have responded to that post telling them they're added, You are free to claim them. If you edit a comment, please make sure no one after you has claimed the card. Please be fair to those that ask for it first! The max amount of special cards you can currently claim is 5. It will always be half of the max claims. The very first post on this will be for errors. If you notice broken links or cards not in the right category, Please let me know by commenting there and I will fix it! If you've read everything, Comment here with what you are claiming! The donation reset will be April 1! This round ends April 1! CLOSED!